as much as last time. We still arrived about five minutes late, but the floods north of Darlington had receded. Instead there were some worse looking floods just south of York, though they didn't delay us. The delay this time was waiting for a platform to clear at York station. Once I got to Newcastle I decided to make I journey I hadn't done for over thirty years - going on the Tyne Valley line to Carlisle. If my train had been on time I would have got the 13.54 topping service to Hexham, where I would have taken some photos of the famous ignal box, before getting the next through train to Carlisle. Unfortunately s my train was late this was not possible. So I got the 14.24 through train to arlisle. Once I got to Carlisle I had a quick cup of tea at a nearby cafe before catching he same unit back to Newcastle. 4/1/13 Newcastle to Heworth. Newcastle to London Kings Cross. London Fenchurch Street to Leigh-on-Sea. Before I returned back to Essex I made he short journey to Heworth over the High Level Tyne Bridge to cover that short section of track that I hadn't been on efore. Just before my train came in, two coal trains passed through Newcastle station within five minutes of each other from the north omewhere. The second, a GBRF hauled service was waiting on the freight line on he other side of the High Level bridge having crossed via the King Edward Bridge. Presumably it was going to Tyne Dock. I came back on the etro which is great fun plunging down into the dark tunnel at Gateshead, before emerging onto the new bridge above the River Tyne. 25/1/13 Leigh-on-Sea to London Febchurch Street and return. My wife and I were spending a few days away in Warwickshire, so decided to pay a visit to the Severn Valley Railway. I had been on it before about twenty years ago and then only travelled over half of it. This time my wife and I went all the way from Kidderminster to Bridgenorth and back. Whilst it is one of the biggest and well known of the preserved railway lines in Britain, there were some aspects of my visit that were disappointing. Firstly, it is not exactly well sign posted when you get to Kidderminster station by road. It was fine on the outskirts and then all of a sudden the station is upon you with no sign indicating turn left/right which must catch some visitors out. Secondly I though the £17 fare was a bit steep. We only wanted to go up and down the line once, but you have to buy a rover ticket to do this anyway. This does include a visit to their museum at Highley, but as we didn't want to visit this it would be nice to have a cheaper option for travelling all the way along the line. On the positive side it was nice to have a trolley service on the train both ways and all the stations are nicely made up to look like you have travelled back in time. Going, the train was quite full, it being half term, but coming back we had a carriage all to oursleves. There was this irritating guard though who kept calling out at each station to move along to the next carriage if we were getting off, in spite of the fact that he asked where we were going when he checked our tickets! Would I go on it again? Probably not. 16/3/13 - Rayleigh to Liverpool Street and return. My only train journey of the month was to go up to London to see the reformed original Status Quo play at Hammersmith Odeon. So all in all a very quiet month for railways. But I make up for it in April! 4/4/13 Bodmin General to Boscarne Junction and return. 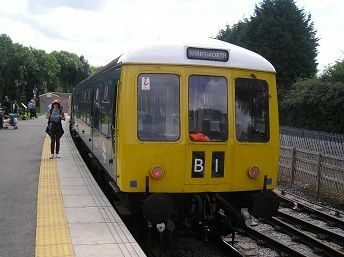 Bodmin General to Bodmin Parkway and return. I spent a few days away down in Devon with my wife and we ventured into Cornwall on one of them, driving from Plymouth, where we were staying. In the morning we visited Lanhydrock House near Bodmin, then in the afternoon, we had a ride on the Bodmin and Wenford railway. 7/4/13 Leigh-on-Sea to London Fenchurch Street and return. 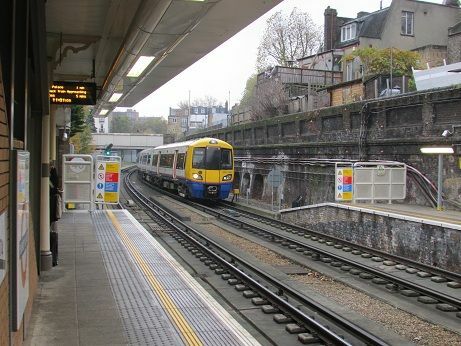 London Marylebone to Wembley Stadium and return. No sooner had I returned home from my short break in Devon, that I went up to London to see Southend United get beaten by Crewe Alexandra in the final of the Johnston's paint trophy at Wembley Stadium. Although Southend took over 30,000 fans to wemnbley, it seemd that very few of them knew of this route to Wembley from Marylebone. Going there were only about ten fans on the special Wembley Stadium only train. Coming back there must have been about forty, so some did know about it after all! 10/4/13 Leigh-on-Sea to London Fenchurch Street and return. London Marylebone to Birmingham Snow Hill. Birmingham Moor Street to London Marylebone. Just 48 hours later I am back at Marylebone as I had to go up to Birmingham with my work. As I had plenty of time, I chose to go the Chiltern route which is much more enjoyable and pleasant as opposed to the WCML route with Virgin which I find too fast and rocky on those Pendelinos. Besides it was only £9 each way, though sadly I didn't get to go in loco hauled service. 14/4/13 Leigh-on-Sea to London Fenchurch Street and return. 17/4/13 Leigh-on-Sea to London Fenchurch Street and return. Went on this excursionto the Wensleydale Railway which was organised by UK Rail Tours - my first rail excursion since last year. Had to get up at 5.30 am in order to get to St Pancras for a 7.40am departure. 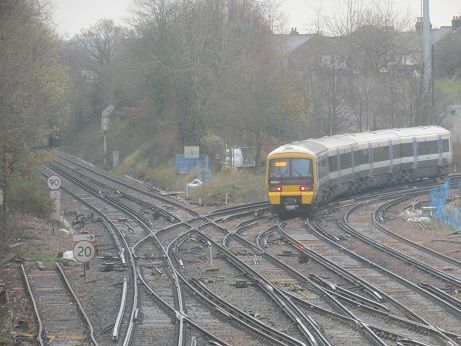 I would have gone on the c2c line from Leigh-on-Sea but as all trains were being diverted via Tilbury and some of the London Underground was closed, it was easier to go from Rayleigh into Liverpool Street. Even then I had to go via the Central and Northern Lines as the more convenient Circle line wasn't running after Moorgate. As usual we had an East Midlands 125 DMU taking us via the Erewash Valley Line and then we went right at Chesterfield and cut off Sheffield emerging at the old Rotherham Masborough station. We should have gone on to York via Moorthorpe and Church Fenton, but due to the driver not knowing that route, we went via Doncaster instead. The reversal just after Northallerton went OK and we crawled along the branch at 10 mph at first, before having a twenty minute stop at Leeming Bar, where we were able to photograph the wide variety of locos there. 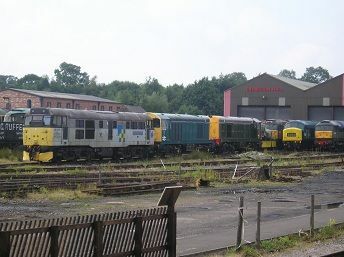 It was a bit like a swarm of locusts emerging from the train and into the yard where the locos were stored! Next stop was for 45 minutes at Leyburn and then we went all the way to Redmire for a quick twenty minute stop. There isn't really anything to see at Redmire apart from the old station house and a nice view of the Pennines to the south, but most passengers chose to complete the journey, rather than hanging around Leyburn. On the way back we had another 45 minute break, this time at Bedale and then we had to wait twenty minutes before we could get back onto the East Coast Mainline. I got off at York and got a quicker East Coast train back to Kings Cross, rather going back all the way to St Pancras which saved me over an hour in time. All in all a good day out, with nice spring weather and lots of people turning out to photograph the train. 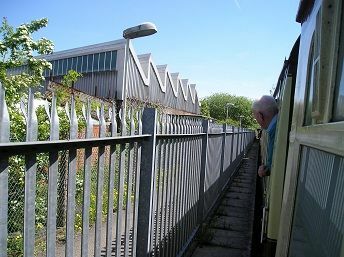 Sinfin Central station - what remains of it! 17/5/13 - Leigh-on-Sea to London Fenchurch Street and return. London Bridge to East Croydon and return. Went up to London for a business meeting. 18/5/13 - Leigh-on-Sea to London Fenchurch Street and return. This time went up to London to attend a course. 20/5/13 - Leigh-on-Sea to London Fenchurch Street and return. 25/5/13 - St Albans to Crewe via Leicester Wigston South and Glen Parva Junctions and Nuneaton. Crewe to Derby and visits to Chaddesden Sidings and the Sinfin Branch. Derby to Worcester Shrub Hill via the Brimingham avoiding line. Worcester Shrub Hill to Stourbridge Town. Stourbridge Town to Round Oak and return. Stourbridge Town to Walsall via Smethwick Rolfe Street. Walsall to Nuneaton via Sutton Park. Nuneaton to St Albans via Wigston and Glen Parva Junctions. My longest ever train journey in one day, beating travelling through Europe on an overnight sleeper. 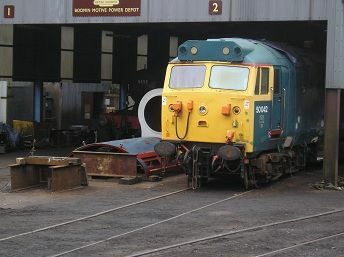 This was on the UK Railtours "The Whitehouse Wanderer" excursion from St Albnas to the East and West Midlands and back. We left St Albans at 07.50 and returned at around 22.30! 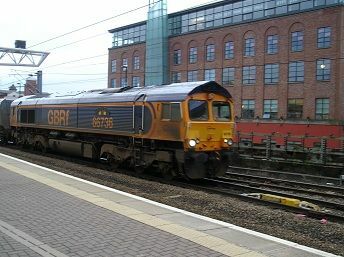 The first part went up the Midland Mainline to just south of Leicester and then made the final pick up at Nuneaton. We then went up the West Caost Mainline to Crewe where we had a half hour break. Then we went back across the the East Midlands to Derby, visiting the Chaddesden sidings, before going down the Sinfin branch. This is where we got behind schedule due to the line being overgrown with branches, despite a weekly freight along the branch to the Rolls Royce works. We then returned to Derby and instead of a half hour break, it was just five minutes. This turned out to be the final leg stretch of the trip, due to us being behind schedule. After going south into Birmingham and across the city at Bordersley, we went onto worcester via the Lickey Incline. we should have stopped at Worcester for ten minuted but this was abandoned. It was then onto Stourbridge and Round Oak, before going up to Walsall and round the north of Birmingham and back to Nuneaton. I felt that the section up to Crewe could have been missed out and instead reversing at Lichfiled and going up to Derby that way. It would have given us more time for Derby and Worcester, but still an interesting trip along several new lines for me. 16/6/2013 Leigh-on-Sea to West Ham and return. Went to see the Who at the O2. My only trip on a train this month in fact. 2/7/2013 Leigh-on-Sea to London Fenchurch Street and return. East Croydon to London Bridge. Had to go to London for a business meeting. 14/7/2013 Leigh-on-Sea to London Fenchurch Street and return. Went to London to watch my son take part in a road race along the embankment. Away in Derbyshire for a few days holiday with my wife. We went for a trip on the Ecclesborne Valley railway, which was mainly a DMU centre. The first part of the line is a very short trip north from Wirksworth station to Ravenstor. Then the second part is a much longer ride south to Duffield, where the line joins up with the Midland Mainline. On the return trip we were able to sit behind the driver and get a driver's eye view of the track ahead. 1/8/2013 Butterley to Riddings Junction and return. Butterley to Hammersmith and return. My second trip on a heritage railway in three days. This time on the Midland Railway Butterley, where we were steam hauled. I would have liked to have got off at Swanwick Junction where the main depot is, but we were going somewhere else. It's a pity the trip doesn't start from this station as opposed to Butterley as there is much more to see here as well as room for parking, etc. Maybe it's because it's in the middle of the countryside. This month I usually travel a lot by train, but in fact this was my only railway journey of the whole month. I didn't even go on a secheduled Network Railway line. This was in fact due to my daughter due to give birth to my first grandchild this month, so we couldn't venture too far in case it happened whilst we were out and about. It did in fact happen on 22nd August in the end, when she gave birth to an 8 lb 2 oz boy. 23/9/2013 Leigh-on-Sea to London Fenchurch Street. London Bridge to East Croydon. East Croydon to Gatwick Airport. On my way up to Scotland for a few days covering both the Far North and Kyle lines. Due to the distance involved, I decide to fly up to Inverness rather than take several trains or indeed the overnight sleeper. I could have flown from Luton but would have had to be up very early to catch a 09.30 flight, so I opt for Flybe from Gatwick which leaves at a more respectable time of 4.30 pm. I arrive in Inverness just after 6 and catch a bus into town, where I stay overnight ready for an early start the next day. I catch the 07.06 from Inverness to Thurso and Wick, which is a 2-car class 158. It isn't too crowded and Scot Rail do a good job providing me with a table seat forwards facing, though this train does not have a refreshment trolley service. So I manage to buy some sandwiches, etc at the WH Smiths on Inverness station before setting off. I have travelled south from Thurso to Inverness several years ago, but have never done the part from Georgemas Junction to Wick before. gone down the branch to Thurso. It's quite a run down station building now, though they have built a large concrete area with crane opposite to lift nuclear waste onto special trains once in a while. 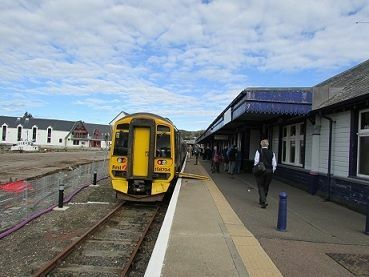 My train comes back within twenty minutes and I am able to complete the section to Wick OK, arriving just after 11.30am. I then spend just under an hour going round the streets of Wick and stopping off for a coffee. Coming back, it seems quicker and the train is busier, but I'm glad to have made the effort, though it takes me all day to do the round trip, arriving back at Inverness shortly before five o'clock. 25/9/23 Inverness to Kyle of Lochalsh and return. Inverness to Stirling. Stirling to Glasgow Queen Street. Glasgow Queen Street to Charing Cross. The train I get is the 09.00 from Inverness which is absolutely packed when I get on, due to two different parties of tourists - about 80 in total, taking up many of the seats. Again it's a 2-car class 158. Someone is sitting in my reserved seat and tells me that they have been double booked. As he is an old man I don't argue and move to the other carriage where I get a fold up seat. By the time we get to Dingwall the guard has found me a seat in 1st class, though it is facing backwards. After someone gets off at Garve, I am able to go in a seat facing forwards, though it doesn't have a table. The train gets even more crowded as different sets of walkers get on, but I am able to see OK. At Kyle of Lochalsh, there's just over half an hour to spend before the train goes out again. I take some pictures and visit the museum on the station platform, though it isn't that big. Then it's back onto the train for the trip back to Inverness. This time it isn't that crowded and the sun comes out so I am able to take some nice pictures of the beautiful mountain and loch scenery. It is a much prettier journey than yesterday's one. I arrive back at Inverness at 14.40 and have just nine minutes to change platforms to catch the 14.49 down to Stirling and then Glasgow. This train has three carriages and is also very crowded, though this time no one is sitting in my seat and I do get a table set which is facing forwards. I spend a lot of the journey admiring the scenery of the highlands, though I do notice how run down Perth station seems to be. Also we stop at Gleneagles and that too seems to have been neglected. When I passed through it in 2010, it had lots of flowers and looked well maintained. Now it is a shadow of its former self. Incidentally the main station sign is unusually at right angles to the platforms, so you can't see the name from the train. At Glasgow Queen Street, I decide to catch a train to Charing Cross where my hotel is, rather than walk. That too is very crowded, this time with commuters going home to the north western Glasgow suburbs. 26/9/13 Charing Cross to Partick and return. Glasgow Central to Haymarket via Carstairs. Southend Airport to Southend Victoria. Southend Central to Leigh-on-Sea. Before leaving Glasgow I make a quick detour to Partick where I have some business to attend to. I then go across Scotland to Edinburgh. Rather than leaveing form the obvious choice of Queen Street,. I am able to take a Cross Country train from Glasgow Central to Edinburgh Waverley, which goes down the West Coast mainline as far as Carstairs, before going north eastwards to Edinburgh. I'd found out about form the internet and they have special walk up fares of only £8, or £10 1st class. I decide to buy a 1st class ticket seeing as it is so cheap. But when I pay for my ticket it has gone up to £12.00! Still I get coffee and biscuits included in the price! I then fly back from Edinburgh to Southend, before getting two local trains back to Leigh-on-Sea, after a very enjoyable trip. 12/10/13 - Leigh-on-Sea to London Fenchurch Street and return. London Bridge to East Croydon and return. East Croydon to East Grinstead and return. East Grinstead to Sheffield Park. Sheffield Park to Horsted Keynes. 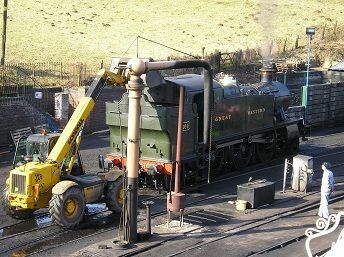 Horsted Keynes to East Grinsted. Went to visit the Bluebell Railway for the day with a friend. We had time to visit the carriage works at Horsted Keynes as well as go all the way from East Ginstead to Sheffield Park and back. It was nice to be able to go through the famous Imberhorne Cutting which was finally opened to through trains earlier this year. It was very busy for October, with at least fifty people on our return train. There was even a special train doing afternoon teas for a private party. I really like Horsted Keynes station, how it has been preserved to such a high standard. No wonder it is used by so many TV and film companies. 30/10/13 - Leigh-on-Sea to London Fenchurch Street and return. London Blackfriars to Loughborough Junction. Loughborough Junction to Beckenham Junction. Norwood junction to East Croydon. Mitcham Junction to Effingham Junction. 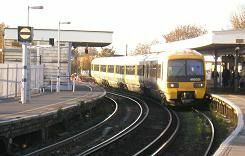 Effingham Junction to Clapham Junction. Clapham Junction to Willesden Junction. Willesden Junction to Harrow & Wealdstone. Harrow & Wealdstone to Watford Junction. Watford Junction to London Euston. Highbury & Islington to Dalston Junction. Dalston Junction to Surrey Quays. This was the day when I managed to visit all nine railway stations in the London area with the name "Junction" in them! 27/11/2013 - Leigh-on-Sea to West Ham. Woolwich Dockyard to Charlton. Charlton to Lewisham. Lewisham to New Cross Gate. New Cross Gate to Surrey Quays. Surrey Quays to Clapham Junction. Clapham Junction to Shepherd's Bush. London Fenchurch Street to Leigh-on-Sea. Went to London to go on some new pieces of track. 16/12/2013 - Gravesend to Rochester and return. Rochester to Swanley and return. Another piece of new track in Kent.